MELINDA GATES is co-chair of the Bill & Melinda Gates Foundation. Along with Bill Gates, she shapes and approves the foundation’s strategies, reviews results, and sets the overall direction of the organization. Together they meet with grantees and partners to further the foundation’s goal of improving equity in the United States and around the world. They use many public appearances to advocate for the foundation’s issues. In July 2012, Melinda Gates made headlines by spearheading the London Summit on Family Planning. She continues to champion the importance of easily available family-planning information and services, with the goal of delivering contraceptives to an additional 120 million women in developing countries by 2020. Melinda has stated that empowering women and girls in developing countries to decide whether and when to have a child is a critical driver of her work at the foundation, since that decision can be the source of transformational improvements in the health and prosperity of whole societies. 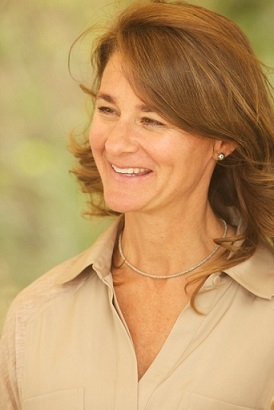 Melinda Gates received a bachelor’s degree in computer science and economics from Duke University in 1986 and a master’s in business administration from Duke’s Fuqua School of Business in 1987. After joining Microsoft Corp. in 1987, she distinguished herself in business as a leader in the development of many of Microsoft’s multimedia products and was appointed as Microsoft’s General Manager of Information Products. In 1996, Gates left the organization and since then, has directed her energy toward the nonprofit world. RENEE MONTAGNE is co-host of NPR's Morning Edition, the most widely heard radio news program in the U.S. Montagne is a familiar voice on NPR, having reported and hosted various programs since the mid-1980s. She hosted All Things Considered with Robert Siegel for two years in the late 1980s, and previously worked for NPR's Science, National and Foreign desks. In addition to the duPont Columbia Award, Montagne has been honored by the Overseas Press Club for her coverage of Afghanistan, and by the National Association of Black Journalists for a series on Black musicians going to war in the 20th century. Her career also includes serving as a fellow at the University of Southern California with the National Arts Journalism Program, and teaching broadcast writing at New York University's Graduate Department of Journalism. Established in 1997, the Arnold C. Harberger Distinguished Lecture on Economic Development celebrates Al Harberger as an eminent scholar and teacher. The lectures provide a special forum for outstanding students of international economics and policy to present their views and research to the UCLA community and the public.